An amazing accessory for the fashionable woman! Made from pure handspun Pashmina, this exquisite, soft, red-black short color, hand woven shawl with paisley and floral kani pallas in bright red. It is elaborately woven stitch by stitch with thin wooden sticks called tojli. This elegant, new, beautifully designed Dorukha (reversible) Border Kani shawl has several colors that sparkle and stand out. This shawl took 4 months to weave. Handle with care. Keep in a moth free, airy place. 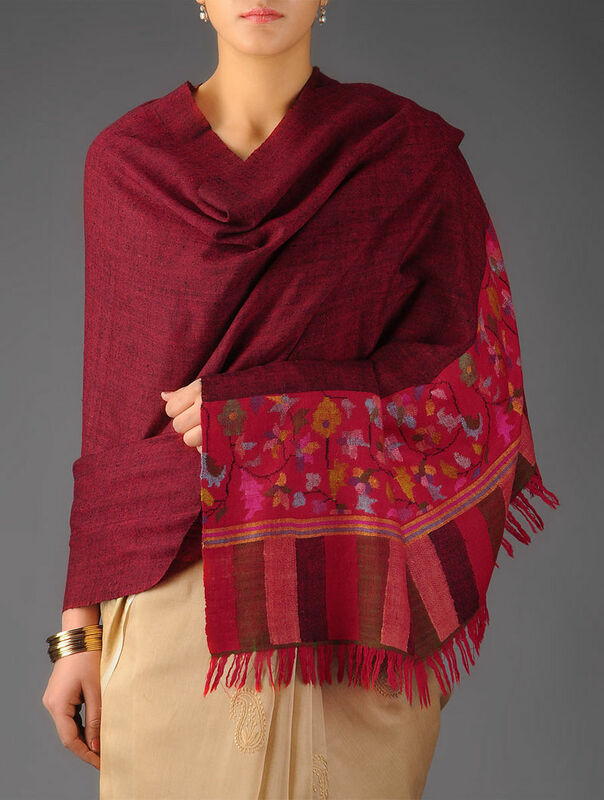 Make sure the shawl does not get caught in jewellery, under the elbow or hips. Clean with white petrol or get high quality dry cleaning done. Steam iron.